With the introduction of IBM Lotus Notes and Domino 7, IBM Lotus continues to set the standard for innovation in the messaging and collaboration market that Lotus defined two decades ago. With Lotus Notes and Domino 7, IBM has enhanced the scalability, security features, administration, interoperability, productivity, and performance, enabling companies to achieve the most from their infrastructure. Upgrading to the latest version of Lotus Notes and Domino can help your organization realize high return on investment, potentially lower the cost of ownership, and help improve user productivity and business responsiveness. 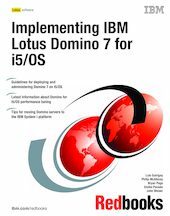 This IBM Redbooks publication targets system administrators who plan to implement or upgrade to Domino 7 for IBM i5/OS in their organization. It provides tips and techniques to help you successfully deploy and administer Domino 7 servers on i5/OS. The primary focus is to explain the installation, configuration, and performance tuning of Domino 7 in this environment. This book also provides information about moving Domino servers to the IBM System i platform and information about backup, recovery, and troubleshooting regarding Domino 7 servers running on i5/OS.